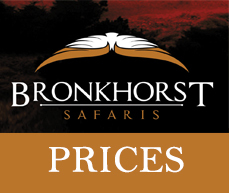 Born and raised in the South African bushveld Phillip Bronkhorst grew up in a hunting family. From as little as the age of five years old I started hunting birds with my dad, a very well experienced feathered game and plains game hunter. Phillip ventured into wildlife management after spending time in Angola doing his national service. Already by then he has realized the value of game and nature and the potential of it as a business. He has also realized that a safari needed to be well planned and conducted to save client money and ensure that everybody can afford a trip at least once to the Dark Continent – AFRICA. A National diploma in Nature Conservation and a full practical year with South African National Parks laid the basis which his experience would be based and build on. Successful guiding several foreign clients since as early as 13 years of age there was no reason for him not ending up as a successful professional hunter and safari operator. While climbing the success ladder and developing his own business Phillip has done guiding for numerous big outfits by the likes of Kapama Safaris, Kgama Safaris where he was awarded Professional Hunter of the year 4 consecutive years in a row, Hunters and Guides Africa, Mziki Safaris and Saaiman Hunting Safaris since 1992. During the month of August 1996 Phillip started his own home base close to the town of Lephalale formerly known as Ellisras. Other than barren land and a couple of old buildings which was on the land what you will find there today was all designed, constructed and introduced by himself. Ellisras being very well situated was chosen as a home base area. Only 4 hours from Johannesburg, 5 hours from the Kruger National Park, 1 hour from the Botswana Border and 5 hours to the Southern tips of Zimbabwe this choice was natural. Phillip is also a respected member of the Professional Hunters Association of South Africa (PHASA), Safari Club International and Dallas Safari Club. sure that your safari is legal and within South African Laws. Since South Africa is the base for all first timers, package hunts are offered as well as traditional safaris for big five species. Several years ago PHILLIP BRONKHORST SAFARIS also started subleasing areas out from Zimbabwean, Mozambican, Zambian, Namibian and Tanzanian concession holders taking care of clients that has completed their plains game experience and wanting to venture into bigger five areas and also collecting and hunting for species that is not available in previously hunted destinations. Hunting areas, safari camps, professional hunters and camp staff is also handpicked to be amongst the best there is in the industry to offer you the client top class service also taking in account that each destination differs from the previous. Pre safari services start with visits to numerous hunting shows and conventions, private parties arranged by previous clients and word of mouth advertising by previous clients. To make sure you have all you want and need in camp and hunting area a client info list is completed and forwarded to PBS administration department. Flight tickets and schedules could be arranged but the use of several reliable travel agents is advised. Detailed safari itinerary and pre safari accounts are to be provided to each client to ensure him what he gets and what he pays for. With PHILLIP BRONKHORST SAFARIS the clients always come first. When we receive your client information back our administrative staff can make sure to put you in the best area by your choice of species and accommodation. From arrival at the port of entry into the destination you are hunting you will be met by a PBS representative and taken to your safari area. Safaris are conducted on a legal and ethical base. Conservation you could have a choice of absolute luxury or a plain safari camp. With a fleet of well-maintained safari vehicles, administration staff, camp staff and trackers and 6 permanent or semi-permanent professional hunters you will experience what luxury treatment means. Like so Zimbabwe, Mozambique, Zambia, Namibia and Tanzania offer you exactly the same treatment you got to know with PHILLIP BRONKHORST SAFARIS. Safaris are not just hunting of trophies with a rifle. 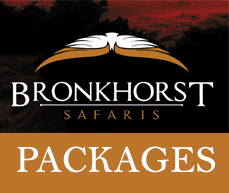 PHILLIP BRONKHORST SAFARIS can also offer you numerous other safari options. You can combine any safari with each other being it a 10-day hunting trip with a 3-day extension visiting Victoria Falls. Photo safaris are conducted by licensed guides into South Africa and places like the Kruger National Park, Lowveld Escarpment, Sun City, Pilanesberg, and the Cape Wine routes could be visited. Trips to the Mozambican Islands of Bazaruto and Benguera could be arranged for a relaxing time as well as to do Scuba Diving, Deep Sea fishing and snorkeling. Safari destinations to fit onto your trip could also include a trip to the world famous Victoria Falls. Accommodation would be in the elegant Victoria Falls Hotel and you could be Livingston yourself exploring the Victoria Falls or be on a sun downer cruise on the mighty Zambezi River. You can even enjoy an Elephant Back Safari and tribal dancing at night. Safety is very important to us, specifically the safety of our clients. All vehicles are fitted with two-way radios making sure you always have communications with fellow hunters or camp. Cell phone coverage is almost 80% in all our South African areas and a satellite phone is available in all northern camps. South African base camps are also equipped with phone, fax, Internet and email facilities. All vehicles are fully equipped and carry a medical aid box. Post safari services include a visit to a taxidermist where you have the choice to see some of the best artwork in the industry and been given the chance to select your choice of mounts fitted to go into your trophy room back home. You are also given the opportunity to acquire various gifts from Africa for the love ones back home which could not make the trip. In short, a safari with PHILLIP BRONKHORST SAFARIS is always an adventure, which you yourself can design and plan.